Now available on DVD. Join David Leadbetter and his pupil out on the golf course, where David demonstrates the importance of developing a strategic approach to the game. Now available on DVD. 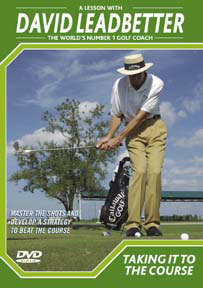 According to David Leadbetter there's more to shooting good scores than just hitting good shots. Watch him coach his pupil around the course, advising him how to think and play his way to a better score. You can also learn the techniques to play your way out of those difficult positions and tricky lies all golfers encounter from time to time. Leadbetter will show you how to really work the ball in the direction and at the height you want it to go. Now you'll begin to master the shots to take on the toughest of courses.